Andalucia is pretty hot a lot of the time, so beer (and sometimes water) is essential. It’s difficult to look ‘hard’ in Spain – ie, surrounding yourself with ten empty pint glasses – as beer (cerveza) is often served as una caña – a small glass that lasts about three minutes. However, you can order a larger glass, a jarra – or a bottle. No Harveys, Dark Star or Timothy Taylor here, unless we just haven’t found it – instead a range of lagers. Mahou – brewed in Madrid – Mahou Cinco Estrellas (5.5%). San Miguel – well known in the UK, brewed in Barcelona and Burgos. 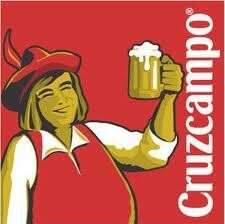 Given a choice – a bottle of Alhambra Reserva or draft Cruzcampo. And Guinness? In Órgiva and surrounding area we didn’t see it, although happy to be put right on this. In Málaga and Granada, yes – in fact we watched a football match in Hannigan’s bar in Granada and the Guinness was great. It’s like anything in Spain; when the sun is shining, all beer tastes good. Thanks for the mention 🙂 I enjoyed reading about the different brands of beer to be found around Andalucía. BTW, the small beer that lasts three minutes is una caña. Hi Marianne – thanks for the correction, it won’t be the first error we’re sure! Looking at your great blog, I’m sure we’ll be adding more links to it. Thanks, S & M.